It’s not very often automobile manufacturers organize public displays of their vintage racecars. In their heyday, these cars are often bruised and battered during the course of on-track battle, and then later restored to an impeccable level to be remembered in all of their pristine glory as years pass. Similar to your grandmother’s sofa with that awful clear plastic cover on it, these vintage pieces of motorsports history—which were bred for assault—instead pass the time quietly aging in temperature-controlled automotive nursing homes, shielded from any sort of contact that could alter their worth. However, late last year, Porsche let the public walk right up to its racing icons of yesteryear at the Rennsport Reunion VI event at WeatherTech Raceway Laguna Seca, where I fell in love with these vehicles. I was particularly enthralled to investigate the details of each one of these cars in the heritage collection, and have mentioned in my past event article how it was my most-frequented section of the paddock while at Rennsport Reunion VI. Not only could you see these history-altering vehicles without any restrictions, borders, or ropes, but we had the opportunity to hear them start up, and watch them race each other for position out on the circuit. For a racing fan like myself, who unfortunately wasn’t alive yet during the supposed golden era of professional motorsports—when restrictions on aero pieces were loose and turbo cars utilized scramble buttons to temporarily run dangerous levels of higher boost—my only way of engaging with these gems are through displays like this one. One of the nuggets of history I was excited to see in the flesh was this 1977 Brumos Porsche 934/5. In order to understand the significance of the 934/5 I must first explain the 934. 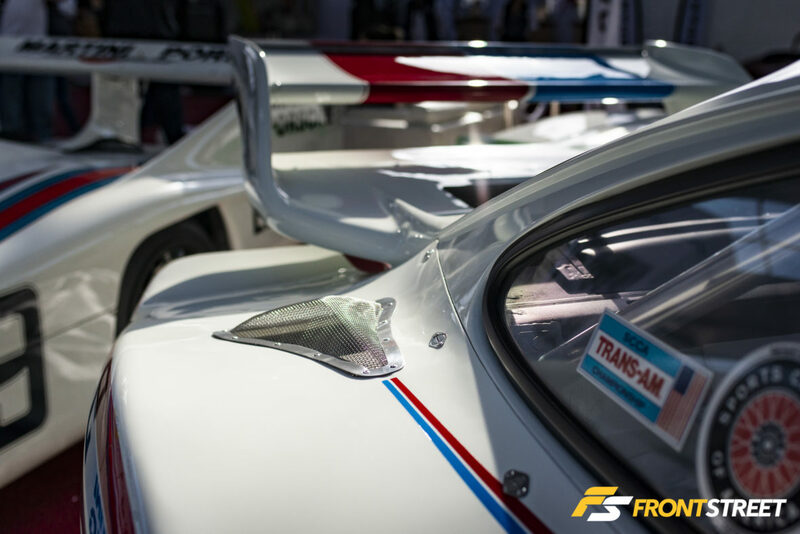 The Group 4-raced 934 Turbo RSR chassis was the closest thing to the road-going 930 variant it was based upon, with a curb weight of just over 2,400 pounds and the same road bumpers and door trim. It was even the first Porsche racecar that had power windows. Output from the 930-spec single-turbo 3.0-liter air-cooled flat-six nudged the 485 horsepower mark, and was subsequently upped to 550 by the end of 1977 through the use of a larger turbocharger. That same year, the 934 evolved between rule book changes into the rare 934/5, and Peter Gregg used it to win the 1977 Trans-Am championship with eight First Place finishes. Accompanying modifications were larger wheels and tires, massive fender flares to widen the body and accept the new rollers, and the unique 934-spec front air dam. The changes allowed for pieces from the more-competitive Group 5 935 cars to make their way onto the 934, which resulted in ten hybrid examples being created, including this chassis, number 930 770 0952. It was an honor for me to see such an influential championship car up close and take in all of the minutiae which made it so successful—and in such an iconic Porsche livery to boot! The paint-matched turbofans on the wide BBS Motorsport wheels, the exceedingly wide flares, the stubby aerodynamic mirrors, and that curvaceous wing off the rear were crazy modifications at the time, and still look wild more than 40 years later. Another car which was admittedly very similar to the 934/5, was the intoxicating Jägermeister-Kremer 1980 Porsche 935 K3. By 1976, Porsche had begun the next evolution of its Carrera RSR 2.1 Turbo prototype fit for FIA competition, but the company was not inclined to sell the cars to just anyone. Out of necessity, in 1980, teams like Kremer Racing in Cologne, Germany, began developing their own improvements to the Porsche chassis—then twelve years old—to make it competitive in the illustrious Group 5 series. Engine size was increased to 3.2-liters from the flat-six, and a second massive turbocharger bumped the output from 590 to over 800 horsepower. Even larger wheels and tires were equipped to handle the extreme power numbers, and braking assistance came off the larger Porsche 917 racecar. Due to the larger wheels and tires, even wider flares were apportioned to the fenders than ever before, and the total curb weight was actually reduced to a mere 2,150 pounds. However, perhaps its most defining improvement was the memorable slant-nose (or ‘flachbau’ in German). Due to a loophole in the Group 5 regulations, Porsche designer Norbert Singer (the namesake of the popular present-day Porsche 911 restoration company, and consultant on the DLS from last week’s article) realized that the front fenders could be re-engineered without the drag-inducing headlights protruding. Instead, a new style of fender was made, which relocated the headlights into the front bumper, and not only reduced drag, but also created additional downforce in the process. In 1979, the 935 K3—the third variant from the Kremer compound—won overall at the 24 Hours of Le Mans, beating out faster, more advanced prototype classes to become the first production-based car to win the fabled race since 1953. This is an incredible achievement to add to the illustrious career of historic race victories for this chassis. Much like the competitors who glimpsed the insane view of the fire-breathing twin-turbochargers sticking out the back, I’ll never forget seeing such a monumental car in Porsche history, and one that is still shaping the way cars are modified to this day like the Old & New body kit for the 997-chassis, or the new Porsche 935 GT2 RS. In the end, I guess I’m glad that boring automotive nursing homes exist around the world. Even though they are the antithesis of motorsport, and cause the spirit of the racecars to die a slow and painful death, they do preserve entire periods of automotive history for future generations like myself to absorb at a later time. Without them I never would have had the opportunity to soak up the alluring details of the exceptionally important Porsche 934/5 and 935 cars that I have now.